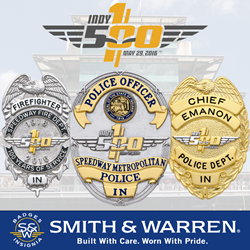 Smith & Warren was chosen to design and manufacture the Indy 500’s 100th Anniversary Badges for Speedway Police, Fire Department, and select surrounding agencies. Smith & Warren was chosen to design and manufacture the Indy 500’s 100th Anniversary Badge for Speedway Police, and Fire Department. America’s premier badge and insignia manufacturing company has also been asked to create a separate version of the commemorative badges, based on our S155 model, for the participating public safety agencies in the area that wanted to honor this once in a lifetime event. “Smith & Warren was our first choice for this project because of their experience in completing numerous large badge projects for the city and throughout the area,” declared Captain Jason S. Dierdorff (of the Speedway Police Department). On May 29th, 2016, the Indy 500 will take place at the Indianapolis Motor Speedway, marking the 100th anniversary of the world’s largest single-day spectator sport. Throughout the week, the Speedway police and surrounding agencies are tasked to secure the well-being of hundreds of thousands of auto-racing enthusiast. More than 200,000 attendees will be enjoying the main event of the 2016 IndyCar Series season, as well as the practices, qualifiers and special events leading up to the big race. Smith & Warren® is a leading U.S. Manufacturer of badges, uniform insignia, accessories, and is a GSA Schedule contract holder and certified manufacturer to the Institute of Heraldry for the manufacture and supply of official U.S. Army badges and insignia. Smith & Warren has been proudly manufacturing uniform badges and insignia in the United States since 1925, and is the most technologically advanced badge manufacturer in the United States. The finest materials are combined with cutting edge manufacturing technology to produce a product that can be worn with pride. Smith & Warren® is the only badge that comes with a Full Lifetime Warranty. To learn more about Smith & Warren® visit http://www.smithwarren.com .